The Salomon Speedway has a lot of influence from the Super 8 but still has a lot of its own personality. It is definitely a bump towards the, lighter, more poppy higher end side of things. It is a very fun board for those that love to turn. Conditions: Some really good groomers and some pretty fun powder in Utah and some good groomers in the PNW. Approximate Weight: Feels normal bordering on light. Flex/Buttering: The flex is lively and snaps back hard but it isn’t as stiff as you would think. Still, it is fast and damp on the snow. Not really the kind of board you get to butter but it is doable. Especially so if you have lots of experience getting full camber boards to butter. Sizing: At the time we demod this (last winter before it came out) we didn’t have any information on it and didn’t have a Salomon Catalogue. We thought it had the same sizing as the Super 8 but instead, it goes from 155 to 160 and then to 165 and 170. So in the review, we said 157 would be ideal but because there isn’t a 157 the 160 is for sure the best fit for us. It would be fun to try the 165 on some wide open groomers but the 160 is a really good call for a daily driver solution. As you get into the 165 and 170 the board leans more towards the mid/wide side of the boot size spectrum but the smaller sizes were fine for our 8.5 and 9 boots. On Snow Feel: Very stable but has a lot of full camber personality underfoot. The camber goes from the tail and then transitions to flat but looking at it on the table you can see the flat portion is still off the snow so it is almost a full camber ride. There is only a touch of early rise so it has some consequence to it and caters to that more technical rider that is used to camber but want a touch more when it comes to directional float. 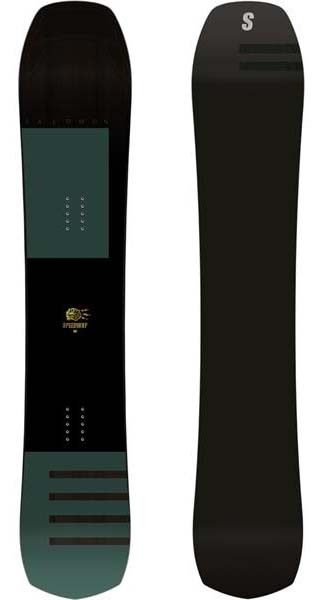 It is a board that has a pretty straight line personality but also loves to turn. Edge Hold: Pretty competent edge hold that holds well enough in hard snow but you have to dial back your turning to not commit to hard to the edge. Turn Initiation: Not super fast edge to edge and I thought it would be faster for such a narrow waist. Still, it got me where I wanted to go when I needed it but it felt like a slower turner for how narrow the waist was in relation to our boot size. Turning Experience: Super fun to turn and the Salomon Speedway really shines here. When we got on good groomers it was fun to make just about any kind of turn but it really lit up for us with medium to wider radius turns. It also did a great job with those long drawn out S-Turns that is almost like a straight line. For 6mm of taper, it doesn’t have that slashy tapered personality and the tail holds well on a turn. It likes a little more weight on the back foot but it wasn’t washy for us when we rode it more centered. Carving: Carves really well and the full camber does a great job laying it out on clean groomers. There is lots of spring out of the turn and it is super fun to carve. Skidded Turns: Not ideal and it is very close to camber. Not really for intermediate riders unless you want to learn as us old farts did on full camber. Speed: For the flex, the Salomon Speedway really does well. The base is very fast and keeps its speed and the board is much damper than you would think for its flex. Uneven Terrain: Some Salomon boards can have tech in them that makes the board pop super well but it comes at the expense of holding up in the messy snow. In bumps, it can turn well enough but it didn’t have that cheetah like feeling. The Salomon Speedway wasn’t bad in uneven snow but it isn’t the best when it comes to all day riding. Powder: So there isn’t much going on in terms of providing easy directional float but it isn’t bad. Set all the way back at a 22″ stance width you can get 5.25″ back on board which isn’t a lot for a freeride board but it is more than most all-mountain rides we come across. The flat helps mellow out the boards need to point down so it isn’t a cartwheeler/over the handle bars kind of ride or anything like that but it doesn’t have that super easy float like a lot of boards with more prominent early rise in the nose do. It’s better than full camber though. Switch: doable but not what you get this board for. Jumps: There is a lot of pop out of the Salomon Speedway and it has a nice stable platform underfoot to launch off of things. Pipe: Yeah this could work for a more directional pipe rider but it wouldn’t be the first board we would choose. So the Salomon Speedway really shines when it comes to turning, carving, getting some air on perfect groomers so if that is your top priority then this might be a great fit. We try to get as many images of the Salomon Speedway, but forgive us if they're not all there.